Each research module is directed by a principal investigator or two or more co-investigators. 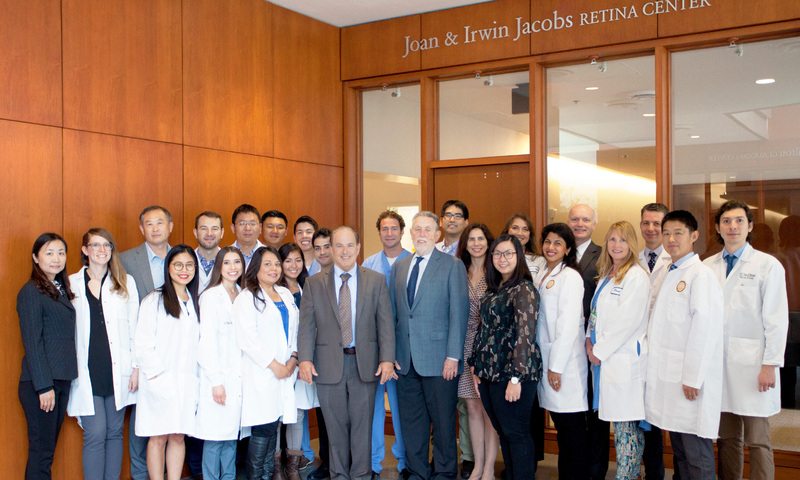 These individuals work in the Jacobs Retina Center and also collaborate with or run laboratories elsewhere on the UCSD campus. They collaborate with the most innovative biotechnology companies in San Diego. Director of Shiley Eye Institute BioBank. Dr. Ayyagari and her research group are performing studies on molecular genetics and therapeutics of retinal degenerations. This includes retinitis pigmentosa, macular degeneration, diabetic retinopathy and other retinal diseases with a genetic basis. These studies involve cloning disease genes, understanding the molecular mechanism underlying the disease process, identification of potential therapeutic targets and developing therapies. She also heads molecular diagnostic testing at the Shiley Eye Institute. She is funded by the National Eye Institute, the Foundation for Fighting Blindness, and Research to Prevent Blindness. Dr. Ayyagari is participating in laboratory and clinical studies of these diseases with the Jacobs Retina Center group. She has published extensively in this area and is an international recognized expert in this field. Dr. Ayyagari has a joint appointment in the Department of Pathology, UCSD. She is a member of the Scientific Advisory Board of the Foundation for Fighting Blindness, National Diagnostic Genotyping Network (NEI), and Indo-US Joint Working Committee (NIH). Dr. Dirk-Uwe Bartsch is director of imaging and lasers at the Jacobs Retina Center. His laboratory has helped to develop scanning laser instruments to improve our ability to image and detect disease in the retina. He works with the entire Jacobs Retina team on many studies including clinical trials. He has been the recipient of major grant awards from the Whittaker Foundation and from the National Eye Institute. He is currently working on new studies of diabetic retinopathy and on new ways to measure retinal damage in HIV disease. He is also working to develop higher resolution instrumentation to further improve our ability to view the retina and ultimately to image individual cells in the living human eye. Daniel L. Chao, M.D., Ph.D.
Dr. Daniel Chao is an Assistant Professor of Ophthalmology at the UCSD Shiley Eye Institute. In addition to seeing patients as a vitreoretinal surgeon, he also serves as an investigator on the various clinical trials at the Jacobs Retina Center. He also runs a translational research program focused on using zebrafish as a model system to identify new therapeutics for retinal diseases such as macular degeneration and diabetic retinopathy. Dr. Lingyun Cheng works closely with members of the School of Engineering and Chemistry (Dr. Michael Sailor) on new drugs and delivery systems which can be applied to or within the eye to treat retinal disease. He co-directs the ocular pharmacology laboratory at the Jacobs Retina Center. Dr. Cheng has published many articles on new ways to package drugs prior to placement in the eye and to provide long lasting treatment for many months of a variety of retinal diseases. He is an expert in the evaluation of retinitis, macular holes, and other important retinal conditions. Maria Laura Gomez, M.D., O.D., M.A.S. Dr. Gomez is an ophthalmologist with an international education. At the Jacobs Retina Center, she focuses on understanding visual function in macular degeneration, diabetes and dry eye using novel computerized medical instruments and diagnostics. Dr. Gomez is also experienced in the FDA approval process and clinical trials of surgical and medical ophthalmic devices. She has published many important papers in optics and visual function in the human eye, particularly in patients with refractive and retinal surgery. Dr. Gomez is fluent in Spanish, English, and French. She is a member of the American Academy of Ophthalmology, International Society of Refractive Surgery, American Society of Optometry and Ophthalmology, PanCornea and American Society of Cataract and Refractive Surgery (ASCRS). Dr. Nudleman is an Assistant Clinical Professor of Ophthalmology at UC San Diego Shiley Eye Institute. He has been with JRC since 2015 and specializes in vitreoretinal diseases and surgey, with an interest in pediatric vitreoretinopathies. In addition, Dr. Nudelman also teaches and participates in research where he focuses on developmental angiogenesis and identifying novel targets to treat vascular diseases. Dr. Oesch’s laboratory studies how retinal neurons communicate with each other to process visual information, using whole cell electrophysiology, optical physiology, and behavioral techniques. Dr. Oesch collaborates with the Jacobs Retina Team on many studies to understand how retinal disease alters the physiology of retinal during disease, and how therapeutic strategies can restore neural communication in the retina. retinal neurons communicate and function. Distinguished Professor, Department of Chemistry and Biochemistry, and Nanoengineering. Dr. Sailor has been collaborating with Dr. Freeman and the Jacobs Retina Center for over ten years. He has over 200 scientific publications in his field of work and is notably known for his research in developing nanoporous silicon, a material many of our treatments use for intraocular drug delivery. Veronica Mendoza, a Senior Clinical Research Coordinator at the Jacobs Retina Center, has worked in the Ophthalmology Department at Shiley Eye Institute for over 10 years before making the transition to pure clinical research and becoming a member of the Jacobs Retina Center team. She is the Lead Clinical Coordinator for several corporate sponsored ophthalmic clinical trials. Veronica has over 20 years experience in patient care, and is certified by the NCLE, (National Contact Lens Examiners Certification), NIH, (National Institute of Health), and is interested in the anterior chamber of the eye as well as the retina. She has extensive experience in visual acuity examinations, visual function exams (including visual field and intricate color testing exams), as well as working with patients diagnosed with HIV, Diabetic Macular Edema, Geographic Atrophy and Macular Degeneration. Nancy Booth, a Clinical Research Coordinator at the Jacobs Retina Center. is new to the Shiley Eye Institute. She was the Program Manager and a Certified Ophthalmic Assistant in the Pediatric Ophthalmology Department at Rady Children’s Hospital for 20 years prior to transitioning to clinical research at Jacobs Retina Center. She is currently certified by several corporate sponsors for ophthalmic clinical trials and is in the process in pursuing her career in Retinal Research and Ophthalmic Photography. Pam has worked at the Shiley Eye Institute as a technician for six years before making the transition to pure clinical research. She is certified by JCAHPO (Joint Commission on Allied Health Personnel in Ophthalmology) as a Certified Ophthalmic Technician (COT). She has been an Ophthalmic Technician for 29 years and has extensive experience in several different aspects of ophthalmology. Pam has over 30 years experience in patient care and is currently certified by several corporate sponsors for ophthalmic clinical trials.